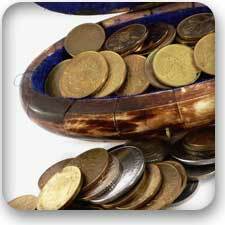 Currency - The currency of Eternus consists of Precious Metals and gems. Each coin or gem is worth x10 more than the one above it on the list. ie 10 to 1 ratio. Note: Coinage above Rhodium is very rarely seen and is often traded for very expensive items or to pay a provinces debt for example. Special: Dragons Eye (Large) * Priceless - Only a handfull in existance. Elven Coinage (only traded among elves) Note: Higher denominations are the same as human. 3) Sun Pieces – Ruthenium – Sun on the front and a river on the back..
5) Jeweled Iron Pieces – 1 to 1 SD = (Cold Iron +4) Picture of a naked nymph on the front and a beautiful lake on the other. 6) Dragon Pieces – Picture of a dragon’s head on one side and a dagger on the other. 7) Queens Silver – Picture of the queen on one side and a picture of a beautiful waterfall on the other. 8) Kings Silver – Picture of king and on other a picture of a bow and sword.